Barbara Mandrell topped the chart with "I Was Country When Country Wasn't Cool", which came to be regarded as her signature song. Hot Country Songs is a chart that ranks the top-performing country music songs in the United States, published by Billboard magazine. In 1981, 48 different singles topped the chart, then published under the title Hot Country Singles, in 52 issues of the magazine, based on playlists submitted by country music radio stations and sales reports submitted by stores. Alabama, Razzy Bailey, T.G. Sheppard and Hank Williams Jr. tied for the most number ones of the year, with three each. As Alabama's "Feels So Right" was one of the few songs to spend a second week at number one, the band had the highest total number of weeks in the top spot, with four. Ten other acts achieved more than one number one in 1981. Several acts topped the chart for the first time in 1981: Charly McClain with "Who's Cheatin' Who", Sylvia with "Drifter", Rosanne Cash with "Seven Year Ache", Earl Thomas Conley with "Fire and Smoke", Ronnie McDowell with "Older Women", Steve Wariner with "All Roads Lead to You", and the duo of David Frizzell and Shelly West with "You're the Reason God Made Oklahoma". Shelly West's appearance at number one fell between two chart-toppers achieved in 1981 by her mother, Dottie West. "King of Rock and Roll" Elvis Presley achieved a posthumous number one with his single "Guitar Man". Upon its original release in 1967, the song had been a minor hit on Billboard's all-genres chart, the Hot 100. More than three years after his death in 1977, however, the song was re-released to promote a similarly-titled album of Presley songs with new instrumental backing tracks created in Nashville by producer Felton Jarvis, and this time became a country number one. Two songs which topped the country chart consecutively in January also topped the Hot 100, albeit several weeks later and in the opposite order. Eddie Rabbitt's "I Love a Rainy Night" topped the country chart in the issue of Billboard dated January 10, and was replaced the following week by Dolly Parton's "9 to 5". On the Hot 100, Parton's song reached the top in the issue dated February 21, was replaced by Rabbitt's song the following week, but then returned to the top spot in the issue dated March 14. The two songs were among just four country songs which topped the Hot 100 during the 1980s, and the only two to do so consecutively. 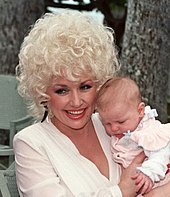 Dolly Parton's "9 to 5" was a country chart-topper and also reached number one on the Billboard Hot 100. A re-release of Elvis Presley's "Guitar Man" gave the "King of Rock and Roll" a country number one more than three years after his death in 1977. Dottie West had two number ones in 1981. Her daughter Shelly West had one. "I Feel Like Loving You Again"
"I Loved 'Em Every One"
^ Betts, Stephen L. (February 5, 2016). "See Miranda Lambert Sing Barbara Mandrell's 'I Was Country'". Rolling Stone. Retrieved March 8, 2018. ^ Bufwack, Mary A. (2003). Finding Her Voice: Women in Country Music, 1800-2000. Country Music Foundation Press. p. 346. ISBN 9780826514325. ^ Fitzharris, Dustin (October 11, 2016). "Country Music's Sylvia Returns With New Music And A New Outlook On Life". The Huffington Post. Retrieved March 8, 2018. ^ Thompson, Gayle (May 23, 2017). "36 Years Ago: Rosanne Cash Earns First No. 1 Single with 'Seven Year Ache'". The Boot. Townsquare Media. Retrieved March 8, 2018. ^ Kingsbury, Paul; McCall, Michael; Rumble, Paul, eds. (2004). The Encyclopedia of Country Music. Oxford University Press. p. 108. ISBN 9780199770557. ^ Huey, Steve. "Ronnie McDowell Biography & History". AllMusic. Retrieved March 8, 2018. ^ "Ronnie McDowell Chart History". Billboard. Retrieved March 8, 2018. ^ Nolan-Wilson, Donna (May 22, 2015). "10 best Steve Wariner songs". AXS TV. Retrieved March 8, 2018. ^ "Shelly West Chart History". Billboard. Retrieved March 8, 2018. ^ Kingsbury, Paul; McCall, Michael; Rumble, Paul, eds. (2004). The Encyclopedia of Country Music. Oxford University Press. p. 184. ISBN 9780199770557. ^ Carlin, Richard (2014). Country Music: A Biographical Dictionary. Routledge. p. 424. ISBN 9781135361044. ^ Collins, Ace (2005). Untold Gold: The Stories Behind Elvis's #1 Hits. Chicago Review Press. p. 251. ISBN 9781569765074. ^ "Hot 100 chart for February 21, 1981". Billboard. Retrieved March 8, 2018. ^ "Hot 100 chart for February 28, 1981". Billboard. Retrieved March 8, 2018. ^ "Hot 100 chart for March 14, 1981". Billboard. Retrieved March 8, 2018. ^ Garner, Kelly K. (2016). So You Want to Sing Country: A Guide for Performers. Rowman & Littlefield. p. 31. ISBN 9781442246416. ^ "Hot Country Songs chart for January 3, 1981". Billboard. Retrieved October 3, 2010. ^ "Hot Country Songs chart for January 10, 1981". Billboard. Retrieved October 3, 2010. ^ "Hot Country Songs chart for January 17, 1981". Billboard. Retrieved October 3, 2010. ^ "Hot Country Songs chart for January 24, 1981". Billboard. Retrieved October 3, 2010. ^ "Hot Country Songs chart for January 31, 1981". Billboard. Retrieved October 3, 2010. ^ "Hot Country Songs chart for February 7, 1981". Billboard. Retrieved October 3, 2010. ^ "Hot Country Songs chart for February 14, 1981". Billboard. Retrieved October 3, 2010. ^ "Hot Country Songs chart for February 21, 1981". Billboard. Retrieved October 3, 2010. ^ "Hot Country Songs chart for February 28, 1981". Billboard. Retrieved October 3, 2010. ^ "Hot Country Songs chart for March 7, 1981". Billboard. Retrieved October 3, 2010. ^ "Hot Country Songs chart for March 14, 1981". Billboard. Retrieved October 3, 2010. ^ "Hot Country Songs chart for March 21, 1981". Billboard. Retrieved October 3, 2010. ^ "Hot Country Songs chart for March 28, 1981". Billboard. Retrieved October 3, 2010. ^ "Hot Country Songs chart for April 4, 1981". Billboard. Retrieved October 3, 2010. ^ "Hot Country Songs chart for April 11, 1981". Billboard. Retrieved October 3, 2010. ^ "Hot Country Songs chart for April 18, 1981". Billboard. Retrieved October 3, 2010. ^ "Hot Country Songs chart for April 25, 1981". Billboard. Retrieved October 3, 2010. ^ "Hot Country Songs chart for May 2, 1981". Billboard. Retrieved October 3, 2010. ^ "Hot Country Songs chart for May 9, 1981". Billboard. Retrieved October 3, 2010. ^ "Hot Country Songs chart for May 16, 1981". Billboard. Retrieved October 3, 2010. ^ "Hot Country Songs chart for May 23, 1981". Billboard. Retrieved October 3, 2010. ^ "Hot Country Songs chart for May 30, 1981". Billboard. Retrieved October 3, 2010. ^ "Hot Country Songs chart for June 6, 1981". Billboard. Retrieved October 3, 2010. ^ "Hot Country Songs chart for June 13, 1981". Billboard. Retrieved October 3, 2010. ^ "Hot Country Songs chart for June 20, 1981". Billboard. Retrieved October 3, 2010. ^ "Hot Country Songs chart for June 27, 1981". Billboard. Retrieved October 3, 2010. ^ "Hot Country Songs chart for July 4, 1981". Billboard. Retrieved October 3, 2010. ^ "Hot Country Songs chart for July 11, 1981". Billboard. Retrieved October 3, 2010. ^ "Hot Country Songs chart for July 18, 1981". Billboard. Retrieved October 3, 2010. ^ "Hot Country Songs chart for July 25, 1981". Billboard. Retrieved October 3, 2010. ^ "Hot Country Songs chart for August 1, 1981". Billboard. Retrieved October 3, 2010. ^ "Hot Country Songs chart for August 8, 1981". Billboard. Retrieved October 3, 2010. ^ "Hot Country Songs chart for August 15, 1981". Billboard. Retrieved October 3, 2010. ^ "Hot Country Songs chart for August 22, 1981". Billboard. Retrieved October 3, 2010. ^ "Hot Country Songs chart for August 29, 1981". Billboard. Retrieved October 3, 2010. ^ "Hot Country Songs chart for September 5, 1981". Billboard. Retrieved October 3, 2010. ^ "Hot Country Songs chart for September 12, 1981". Billboard. Retrieved October 3, 2010. ^ "Hot Country Songs chart for September 19, 1981". Billboard. Retrieved October 3, 2010. ^ "Hot Country Songs chart for September 26, 1981". Billboard. Retrieved October 3, 2010. ^ "Hot Country Songs chart for October 3, 1981". Billboard. Retrieved October 3, 2010. ^ "Hot Country Songs chart for October 10, 1981". Billboard. Retrieved October 3, 2010. ^ "Hot Country Songs chart for October 17, 1981". Billboard. Retrieved October 3, 2010. ^ "Hot Country Songs chart for October 24, 1981". Billboard. Retrieved October 3, 2010. ^ "Hot Country Songs chart for October 31, 1981". Billboard. Retrieved October 3, 2010. ^ "Hot Country Songs chart for November 7, 1981". Billboard. Retrieved October 3, 2010. ^ "Hot Country Songs chart for November 14, 1981". Billboard. Retrieved October 3, 2010. ^ "Hot Country Songs chart for November 21, 1981". Billboard. Retrieved October 3, 2010. ^ "Hot Country Songs chart for November 28, 1981". Billboard. Retrieved October 3, 2010. ^ "Hot Country Songs chart for December 5, 1981". Billboard. Retrieved October 3, 2010. ^ "Hot Country Songs chart for December 12, 1981". Billboard. Retrieved October 3, 2010. ^ "Hot Country Songs chart for December 19, 1981". Billboard. Retrieved October 3, 2010. ^ "Hot Country Songs chart for December 26, 1981". Billboard. Retrieved October 3, 2010. This page was last edited on 6 April 2018, at 18:00 (UTC).